Twin Dolphin is the latest Fred Couples-designed course. Viva, Mexico! 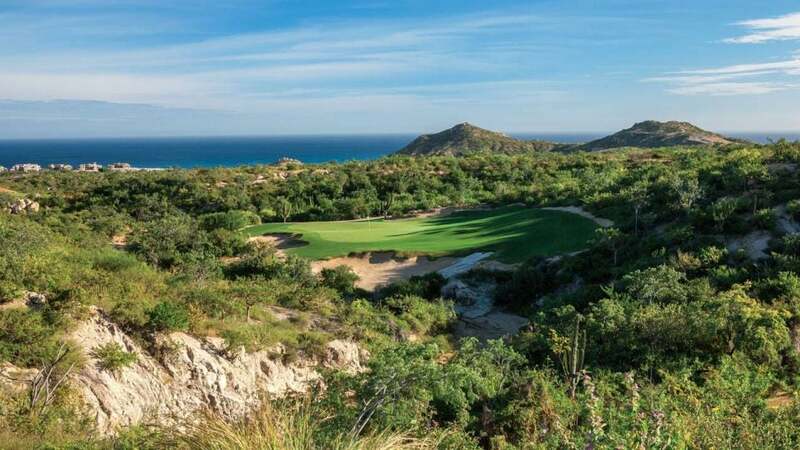 Ten years in the making, the Fred Couples-designed Twin Dolphin makes a splashy Cabo debut. The saddest of all fishing tales is always about the one that got away. That almost happened to Fred Couples and architect Todd Eckenrode with Twin Dolphin Golf Club in Los Cabos, Mexico. Planned in 2008, their golf course never got on or off the ground, a victim of the recession. Eight years later, Twin Dolphin was back on line, and Couples reeled in his big fish. Named for the iconic and now long gone Cabo hotel that stood on the same spot, Twin Dolphin is much like the creature it depicts: It’s handsome, playful and full of smarts. Eckenrode noted that the goal from the beginning was to create something different in Cabo, a region blessed with a plethora of gorgeous but demanding desert courses. Arroyos (dry desert washes) of varying width and depth criss-cross the tract, adding beauty, peril and strategic interest. Holes play over them, adjacent to them and even down into them, notably at the 178-yard, par-3 eighth. The 389-yard par 4 that follows is one of a kind, with massive bluff walls framing the action. Dramatic rock outcroppings, lacy-edged bunkers and naturally rippled fairways all contribute to the ambience. The Sea of Cortez and Pacific Ocean form the backdrop on nearly every hole on this hillside layout, dramatically so on the course’s most memorable stretch, holes 14-16. The tee at the 212-yard, par-3 14th sits at the property’s highest point, 300 feet above sea level, and yields glorious ocean vistas. Equally spectacular is the 420-yard, par-4 15th, which skirts an arroyo and then tumbles down to the sea. The risk/reward 593-yard, par-5 16th sports a second shot landing area bisected by a narrow desert wash.
One of Couples’ most significant design contributions occurs at the shortish par-4 second, a dogleg right that looks south at the Sea of Cortez and San Jose del Cabo. Freddie insisted on doubling the width of the green site and widening the hole overall. Couples anticipates bringing his mid-handicap buddies down to play and he wants his course to be enjoyable for everyone. Hey, this is Boom Boom’s special place. How can it be anything except laid-back fun?